In electronics terminology, a decoder is a combinational logic circuit that transforms a code into a set of signals. A decoder circuit does exactly the reverse of encoding. It has multiple inputs and outputs, and it’s usually used to convert coded inputs into coded outputs provided both of them are different from each other. In simple terms, it’s a device that translates encoded data or information into its original format. As the name suggests, it decodes encoded data. So the input code generally has fewer bits than the bits in the output code. A decoder is used in user interface in most of the output devices such as monitors, printers, calculators, DVD players, etc. Unlike an encoder which takes 2^n input lines and produces n output lines, a decoder takes n input lines and produces 2^n output lines. It receives the input data from the code and decrypts it into the required data, which is reflected as the output. The inputs of a binary code can be 2-bit, 3-bit, or 4-bit codes, depending on the number of input lines. In some cases, decoders have less than 2^n input lines, so at least one output pattern gets repeated for different input values. Decoders are frequently used in communication systems such as wireless communication, networking, telecommunication, etc. 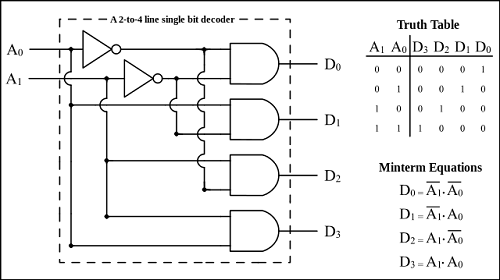 The most common types of binary decoders used in digital electronics are 2-to-4, 3-to-8, and 4-to-16. 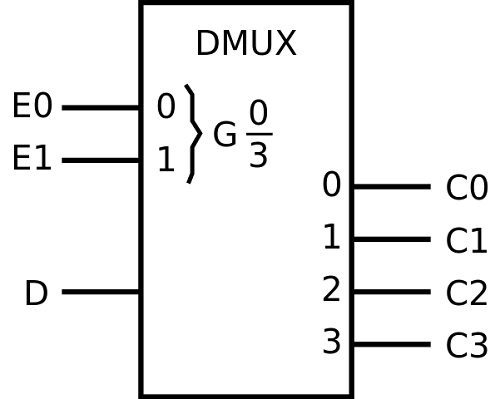 A Demultiplexer, sometimes abbreviated as DMUX, is also a combinational logic circuit that takes one input line and routes it to several digital output lines. It essentially transmits the required data from one line to 2^n possible output lines, hence it’s also called as a data distributor. It forwards the input data to one of the output lines, depending on the values of the input. Demultiplexers are used to implement general purpose logic. They are used when a circuit tries to send a signal to one of many devices. As the name suggests, it does exactly the opposite of what a digital multiplexer does, which on the contrary takes n input lines and routes it to one output line. The idea is to inverse the function of a multiplexer – that is to consolidate one input data stream into multiple data streams. The difference between a multiplexer and a Demultiplexer is subtle. For example, when stereo audio is to be added to a video file, it needs to be multiplexed (or muxed) with the left and right audio channels. On the contrary, if the audio is to be stripped from the video file, it requires demultiplexing which would separate the audio and video files. In simple terms, it converts a signal from a number of analog or digital signal streams into separate unrelated signals. It determines a selected transmission path from numerous control select lines. Definition of Decoder and Demultiplexer– The key difference between a decoder and a Demultiplexer is that the former is a logic circuit that decrypts an encoded bit stream from one format into another, while the latter is a combination circuit that routes a single input line to multiple digital output lines. Function of Decoder and a Demultiplexer – Decoder is the inverse function of an encoder, which is to translate coded digital input signals into equivalent coded output signals. Demultiplexer, on the other hand, does exactly the opposite of what a multiplexer does, which is to consolidate several data streams into a single stream of media or information. Characteristic of Decoder and a Demultiplexer – A decoder takes n input lines and produces 2^n output lines, unlike an encoder which takes 2^n input lines and produces n output lines. A Demultiplexer transmits data from one line to 2^n possible output lines, where the output line is determined by n select lines. Types of Decoder and a Demultiplexer– Decoders are generally categorized into 2-to-4 decoders, 3-to-8 decoders, and 4-to-16 decoders. Demultiplexers, on the other hand, are classified into 1-4 demultiplexers, 1-8 demultiplexers, and 1-16 demultiplexers. Applications of Decoder and a Demultiplexer– Both multiplexers and demultiplexers are widely used in communication systems such as telecommunication and networking solutions. It receives the output signal from the multiplexer and converts it back into its original format. Decoders are used in a variety of applications such as wireless communication, seven segment displays, data demultiplexing, memory address decoding, and more. It’s a logic circuit that decodes an encrypted input stream from one format to another. It’s a combination circuit that is used to implement general purpose logic. It routes a single input signal to one of many output signals. It is the inverse function of an encoder. It is the inverse function of a multiplexer. It takes n input lines and produces 2^n output lines, which is exactly the opposite of what an encoder does. It transmits data from one line to 2^n possible output lines, where the output line is determined by n select lines. They are categorized into 2-to-4 decoders, 3-to-8 decoders, and 4-to-16 decoders. These are classified into 1-4 demultiplexers, 1-8 demultiplexers, and 1-16 demultiplexers. It has no selection lines. Output line is determined by the value of select lines. They are practically used in many applications such as data demultiplexing, memory address decoding, etc. They are mainly used in communication systems and networking solutions for security purposes. The difference between the two is very subtle, which in fact requires a thorough understanding of the concept of combinational logic circuits. A decoder can be described as a logic circuit with many inputs and many outputs, whereas a demultiplexer is a combination circuit that has one input and several outputs. While they both are the basic concepts of digital circuits, they are very different from each other. A decoder takes n inputs depending on the value of the inputs and produces 2^n outputs, whereas a demultiplexer takes a single data input and routes it to one of 2^n possible data outputs. Additionally, there are select lines present in demultiplexers, whereas there are no select lines in decoders. Sagar Khillar. "Difference between Decoder and Demultiplexer." DifferenceBetween.net. January 23, 2018 < http://www.differencebetween.net/technology/difference-between-decoder-and-demultiplexer/ >.